Winter has been taking its toll in many ways over the past few days, but probably the most stunning example can be seen in downtown Sandpoint this morning. 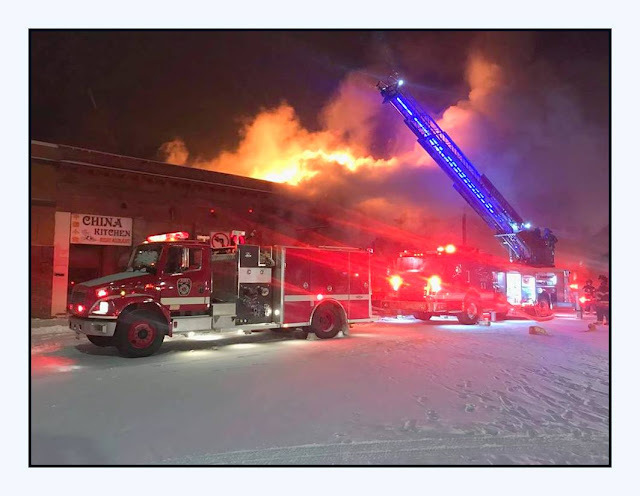 Four businesses [news updates suggesting five or six] on First Avenue were destroyed by fire overnight, and the crews are still at the scene as I type. Facebook has been alive this morning with speculation as to which businesses, but folks seem to know for sure that the hair salon and the Hound on Bridge and First were two of the affected businesses. The destruction extends north from Bridge Street, and, among readers, there are some discrepancies regarding the other businesses. To say that this tragedy has caused a hole in the heart of Sandpoint would be an understatement, both literally and figuratively. It's for certain that most residents around the area either know the business owners, have patronized the stores or are keenly aware of the history of the structures as the store names changed over the years. For me personally, one image is pedaling my bicycle to City Beach from our North Boyer farm on summer days and occasionally succumbing to the alluring aroma of those fresh donuts or maple bars at Haworth's Bakery. Five cents for a maple bar was all it took to satisfy my palate. I didn't always have five cents, but when I did, I savored every last bite before turning that bike homeward. And, if Jim Pucci's old Middle Earth Tavern is part of the conflagration, my most distinct memory: one night sitting at a table with another rookie teacher back in the late '60s-early '70s laughing my head off as Cliff Irish and Jim Jasman joined us and told artful and hilarious tales that only Cliff "the Wild Irishman" could pull off. As we sat there, it was also the first time I ever heard "Rocky Mountain High" with John Denver playing on the juke box. That Middle Earth moment is a favorite image forever etched in my mind. We don't know a lot of specific details about this fire yet, but we, as a community, know that we are very, very sad about this horrific economic and historic loss to our downtown core. May these businesses rise out of the ashes and write newer, happy pages of Sandpoint history as soon as possible. This event certainly serves as a reminder for everyone to take extra precautions during this hazardous winter weather.